From today, you can read classic novels on Instagram thanks to a new program created by Mother and The New York Public Library. Some of the world’s most famous books have had a dramatic makeover -- on Instagram. The New York Public Library joined forces with independent agency Mother in New York to create "Insta Novels." It’s a revolutionary initiative that brings the greatest stories ever written to the social media platform to make them more accessible to the masses. 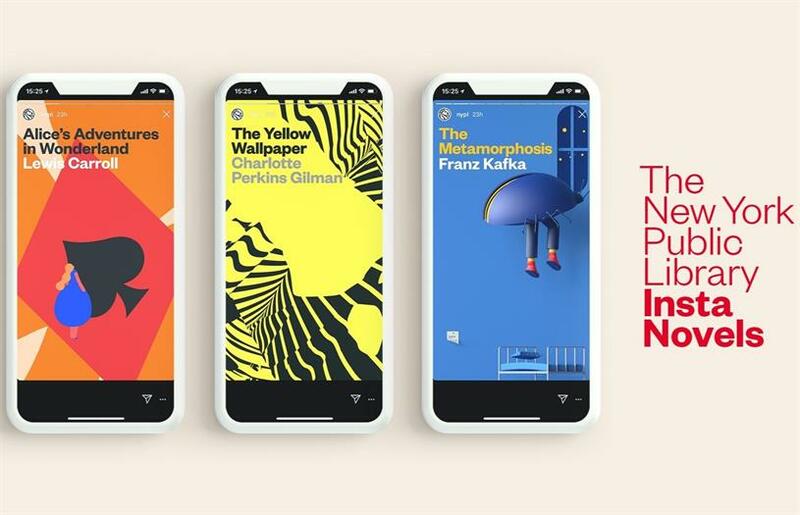 "Instagram unknowingly created the perfect bookshelf for this new kind of online novel," said Corinna Falusi, partner and chief creative officer at Mother in New York. "From the way you turn the pages, to where you rest your thumb while reading, the experience is already unmistakably like reading a paperback novel. We have to promote the value of reading, especially with today's threats to American system of education." The program, which launches today on the Library’s Instagram account (@nypl), kicks off with a newly-digitized version of Alice in Wonderland by Lewis Carroll. The novel is illustrated by well-known designer Magoz (@magoz). In the coming months, two other novels in the program will be released: "The Yellow Wallpaper," a short story by Charlotte Perkins Gilman illustrated by Buck (@buck_design), and The Metamorphosis, a novella by Franz Kafka illustrated by César Pelizer (@cesarpelizer). All books are uploaded into Instagram "Stories." Readers rest their thumbs on the screen to hold the page. They lift their thumbs to turn the page. The thumb-holder also doubles as a flip-book -- if a reader lets the book run they see an animation. Using the "Highlights" feature, each novel is saved as a work of digital literature that readers can access at any time. This essentially turns "Highlights" into a digital bookshelf. Carrie Welch, The New York Public Library’s chief of external relations, said: "This project is directly in line with the Library’s mission is to make the world’s knowledge accessible to all. "It’s appropriate that one of the works we’re using is The Metamorphosis, because in collaboration with Mother, we are completely transforming the way people look at this popular social media platform, and reimagining the way people access the classics." The nature of 'brand trust' is changing. Are you?